Search engines like Google and Bing become smarter in the processing and analysis of a text. Just adding your focus keyword to many places in your text is ‘old school thinking’ and does not help you to rank high. To get back on the first page, it is necessary to write targeted content based on your subject with clever use of the cornerstone keywords and their synonyms. Let’s see what Matt Cutts, ex-Google hotshot, and an expert in search engine optimization says about the use of synonyms. Focus is an extension of The SEO Framework. 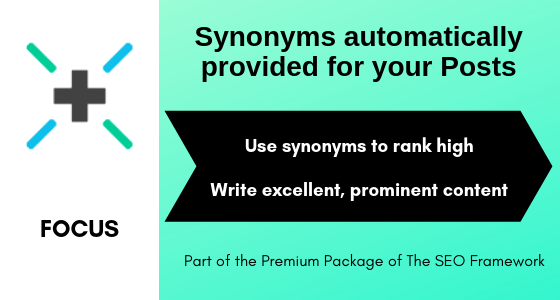 It provides the synonyms of the keywords automatically by using an online external directory. And it helps copywriters and bloggers in writing excellent, prominent content that scores well in search engines. The chance to get to page one is increasing enormously by using these meaningful synonyms. All this makes the Focus extension a must-have add-on for bloggers and text writers. Note: Focus is part of the Premium Package of The SEO Framework.